Leases are registered with government authorities (up to maximum period permitted –currently 30 years) and are renewable. Expected Date of Completion (T.O.P.) Construction takes 12-18 months. 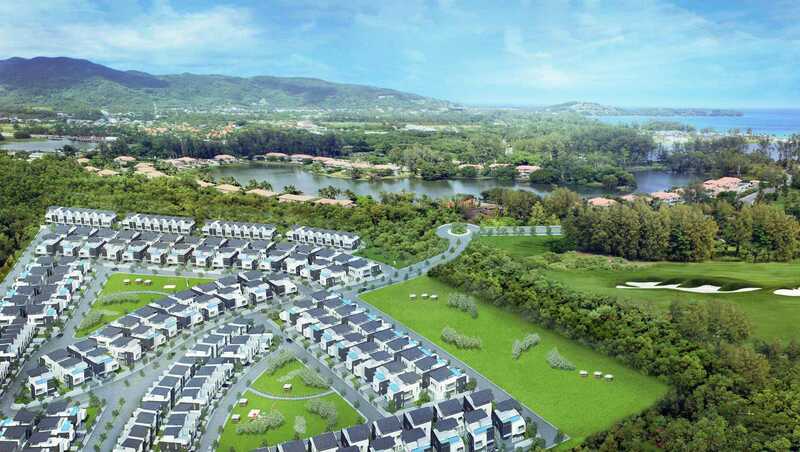 Offering a choice of appealing yet affordable primary and second homes in a secure resort environment, Laguna Park is an inspired new addition to Phuket’s residential community, boasting an unrivalled combination of Condominium units, Townhouses, and Villas. Perfect for couples and small families, the homes are located adjacent to Laguna Phuket, a fully integrated resort and residential community along the island’s stunning west coast. With all the benefits of a safe, clean and well maintained environment, long-term residents are invited to set down roots amid the soothing surroundings, with every convenience provided, including a wide choice of restaurants and bars, indulgent spas, a boutique shopping village, and even an 18-hole golf course right on the doorstep. At Laguna Park, we believe in the family and community, growing together. Laguna Park Townhomes are ideal for smaller families, couples or single professionals who appreciate the functionality of a compact yet imaginative design without sacrificing the freedom of additional living spaces. Corner-unit Townhomes are located at either end of a row. While identical in terms of configuration with the standard Townhomes, the corner units benefit from greater overall width, as well as an additional side lawn running down the length of the property. All homeowners have the option to reconfigure the top floor of their Townhome to suit their own individual needs. So depending on residents’ lifestyle preferences, additional dining, living, bedroom spaces or even a jacuzzi are all distinct possibilities. The largest of the Laguna Park homes, the three-storey Villas, offer generous, practical spaces for a family. The Villas differ from the Townhomes in that they all feature multiple living spaces, maid’s quarters with a separate entrance, as well as four bedrooms with an option to add a fifth bedroom or living space. The first floor comprises a second living room and three comfortable bedrooms. The generous master bedroom features plenty of space, a spacious bathroom, and a private terrace. The two well-appointed guest bedrooms located on this level of the house are both en-suite. As with the Townhomes, owners have the option to customize the top floor to suit their lifestyle preferences be it additional dining, living, or bedroom space, rooftop pool, or even barbecue area complete with al fresco dining and open air gazebo for owners who entertain often and enjoy the tropical sunshine.